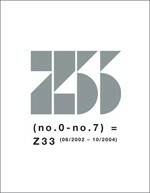 This book shows an overview of the projects held in Z33, a centre of contemporary art and design based in Hasselt, between June 2002 and October 2004. The projects are divided into 7 chapters running from No. 0 to No.7, each defining their own theme and investigation project.